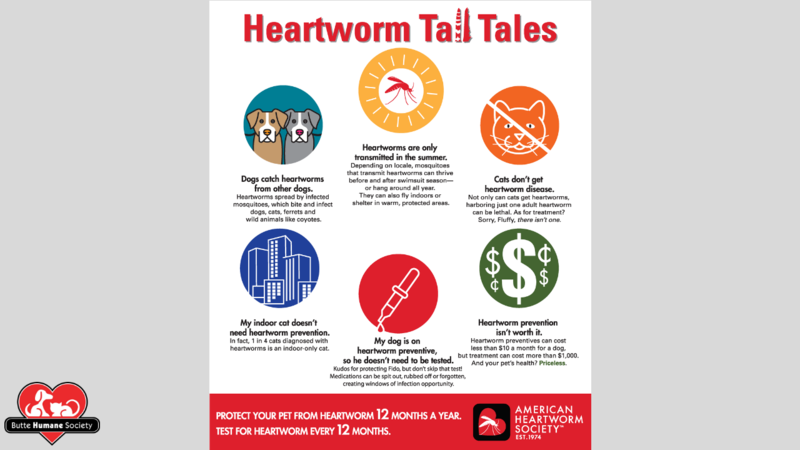 April is Heartworm Awareness Month! The Butte Humane Society Clinic is a proud member of the American Heartworm Society and we are committed to keeping our clients informed and educated to best protect their pets. Did you know that both cats and dogs have been diagnosed with heartworm in all 50 states? Heartworm is an invasive parasite that is transmitted by mosquitos. Northern California has a large mosquito problem and the American Heartworm Society estimates that 9 out of 10 mosquitos are carriers in our area. The rate of infection in in dogs in Butte county is 1 in 63! Our clinic alone has diagnosed 5 heartworm positive cases in the last 45 days. Heartworm can be painful for a dog to live with and the treatment is expensive and painful as well. It is important to note that dogs are not the only ones who can suffer at the hands of a heartworm infection, cats can contract heartworms as well. Cat’s immune systems are good at fending off the worms before they become adults; however if a cat becomes infected with heartworm, they are at risk for secondary infections, specifically Heartworm Associated Respiratory Disease, which causes significant inflammation and permanent damage to the lungs. There is no approved treatment for cats infected with heartworm, only supportive care can be offered for the secondary infections that accompany a heartworm infection. Heartworm disease affects the heart, lungs and pulmonary blood vessels of pets and can be fatal to both dogs and cats. 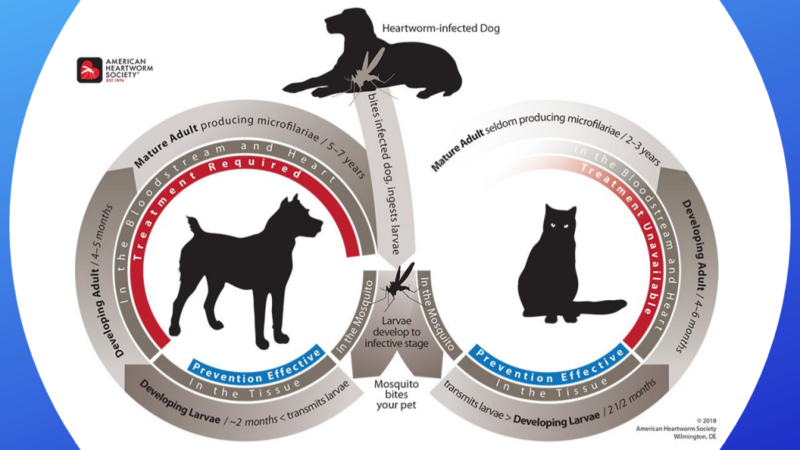 Monthly heartworm prevention should be given for the life of your pet, even if they aren’t outside often- there is no such thing as an “outdoor only mosquito”. Annual testing and monitoring is important- even if they are on heartworm prevention, because prevention (as with human flu vaccines, etc.) is not 100% effective. The earlier an infection is caught- the easier it is to treat! We recommend that your pet starts on monthly heartworm prevention by the time they are 6 months old and have a heartworm test every year to make sure everything is working as it should. If your dog or cat is over 6 months old, is not on heartworm prevention, or has never been tested; we urge you to set up an exam with our veterinarian to get your furry friend tested and started on monthly heartworm prevention. Schedule your appointment today by calling us at 530.343.7917 x 202. We look forward to keeping your furry family member happy and healthy for years to come! 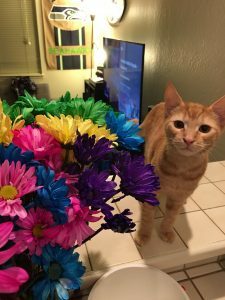 Written by loving adopter, Jordan S.
Everything has been going great! We changed his name to Finley and he is wonderful. We have another kitten, Chewy (used to be Rainier) we adopted from BHS as well who’s the same age and they are best buds and play with each other all the time. Finley is a little more nervous and skittish, but over the past month he has really started to come out of his shell and be more comfortable in his new home. He likes to hide under the bed or anywhere where he feels hidden, he especially loves the bathroom. He likes to growl whenever he has a toy like it’s his kill, but he never attacks Chewy over toys. Of course that doesn’t stop him from rough housing with Chewy and causing mischief around our apartment. When we first brought Finley home, Chewy was unsure at first but then they bonded and Chewy hardly ever leaves Finley alone. He loves his new brother. He also has the worlds loudest purr, we call him our little motorboat. There haven’t been many challenges with Finley, he’s been a great cat! The only thing is Chewy showing him how to cause trouble by climbing all over everything in our home and making messes. Heartworm disease – is your pet protected? Heartworms are something we unfortunately see a lot – in fact, we have diagnosed four positive heartworm cases in the last 30 days. Why should you be concerned? Because we have found that most pet parents in our community are under educated about Heartworm disease and the threat it poses to their pets. The first largely misunderstood concept about heartworm is that you will see them in your pet’s stool like other common worms and that they are prevented by a dewormer. Heartworms never enter your pet’s gastrointestinal tract and you will never see them in your pet’s stool. For the most part, pets don’t even show symptoms until the infection is very severe, and symptoms of heartworm disease are often overlooked by pet parents. The basic symptoms include coughing, activity intolerance, and lethargy. So, let’s get down to the basics about Heartworms and how the infections occur. First, heartworms are transmitted through the bite from an infected mosquito and invade your pet’s blood stream. It is estimated that 9 out of 10 mosquitoes in our area are infected with heartworm, and 1 in 63 dogs in Butte County test positive for heartworms (if everyone tested their pets, this number would be substantially higher). Have you ever heard of an outdoor only mosquito? Neither have we, which brings us to another misconception – “My pet doesn’t go outside, so they will never get heartworm.” The reality is, mosquitoes are prevalent in our area and like most pests, do find a way to enter our homes. Once a mosquito has transmitted heartworms to your pet through a bite, the juvenile heartworms stay in their blood stream for 6 months. As they grow into adult worms, they migrate to your pet’s heart and lungs, where they set up camp and live out their days. If left untreated, they produce offspring and continue to grow in the heart, causing problems like severe lung disease, heart failure, and other organ damage. This disease can be fatal if left untreated. Adult heartworms can live for up to 5 to 7 years in dogs, and 2 to 3 years in cats. The silver lining is that pet’s do not become positive for the disease until the heartworms mature into adults, so if you test your pet and the test is negative, all you have to do is put your pet on heartworm prevention and make sure they stay on it consistently every month to avoid this painful disease all together. 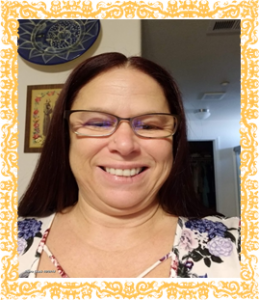 Prevention comes in chewable and topical forms and can vary in price from $7.00 to $20.00 a month depending on the prevention you choose to use. If your pet is not on heartworm prevention and becomes infected with worms that mature to adulthood and invade their heart and lungs, the treatment is much more involved than just providing an inexpensive monthly pill; it takes several months, antibiotics, steroids and a few painful injections to kill the adult worms. The national average cost to treat a heartworm infection on a positive dog is $1500.00 and there is no treatment available for cats, only supportive care for the secondary conditions that arise. We can’t stress enough the importance of monthly prevention to avoid the pain for your pet and the cost of caring for a heartworm positive pet. If your pet has never been tested for heartworm, or has not been consistent on their heartworm prevention every month, it’s time to test and start prevention. Don’t wait and let your pet become a statistic. Contact our Clinic today! 530.343.7917 x 201. Written by loving adopter, Erin C.
Things are wonderful though. We kept the name Mocha. We also adopted Maya (previously Daia) from BHS a couple of years ago. We wanted to get Maya a companion as they are usually roaming the back yard while we are at work during the day. Maya and Mocha hit it off wonderfully! It’s amazing. They have the same temperament and love to gnaw on each others legs and ears and wrestle. They snuggle and play hard. Maya had to have surgery right after we adopted her and now she doesn’t have a femur attached to her back hip but you would never know it. Mocha has been great for her to get exercise and be playful. They both have such sweet personalities. They both love to snuggle with each other and our family. Mocha loves to paw to get attention…it’s pretty cute and a new characteristic we learned about her. We also found that they love going to the river. Mocha can jump super far and the kids love playing with her in the water. She was nervous at first but once she got used to it we couldn’t get her out of the river or our pool! We have 3 young boys (5,7,&10) and they love both the dogs. Mocha has found sleeping with the oldest is her favorite! 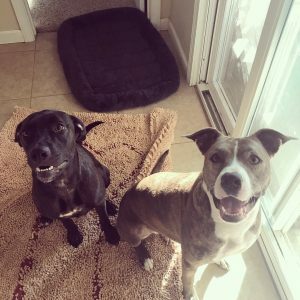 They are both high energy dogs and we were a little concerned at first how they would get along because the initial meeting of them at BHS was not the greatest first impression. We went back with out Maya again and took our youngest son. The interaction was positive and we decided based on what we saw to give it a go. Maya and Mocha are best friends now and Maya has been teaching her good habits!